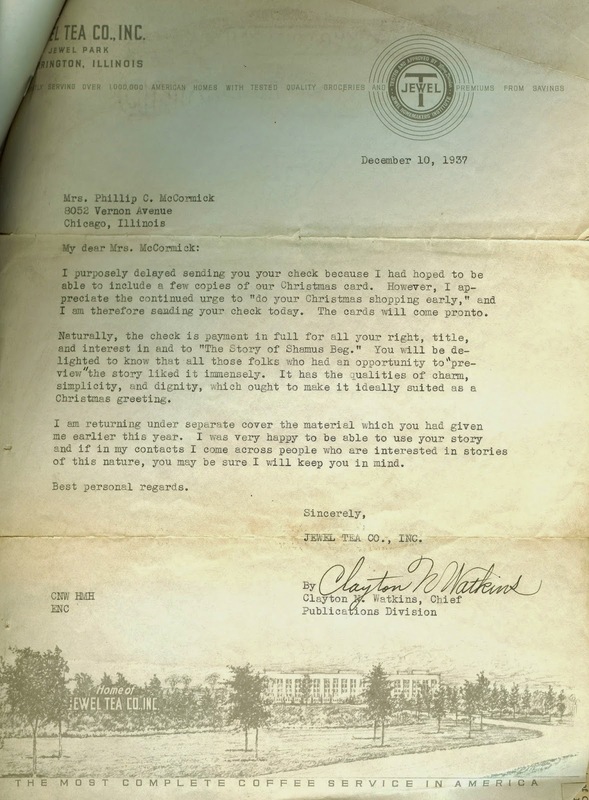 One morning in mid-December, 1937, just months after returning from her trip to Mexico with my great-uncle Phil, my great-aunt “Detty,” or Benita (McGinnis) McCormick, opened her mailbox to find a check in the amount of $50. It was payment for a Christmas story she had sold to The Jewel Tea Company for use in their company Christmas cards. The Jewel Tea Company originated in Chicago, but as its success grew, the company relocated to Barrington Illinois. Though the company originally started out selling tea and coffee, it gradually expanded to include a trademark china pattern and a variety of household goods. Whether or not the Christmas cards noted here were sent to customers is a mystery. So, too, are the cards themselves and even the subject of this letter, The Story of Shamus Beg. Nonetheless, knowing my Aunt Detty’s vivid imagination, her story must have been filled with fanciful prose and whimsical sketches of leprechauns, or “little people,” probably based on the tales she heard during her travels in Ireland nearly a quarter of a century earlier. I purposely delayed sending you your check because I had hoped to be able to include a few copies of our Christmas card. However, I appreciate the continued urge to “do your Christmas shopping early,” and I am therefore sending your check today. The cards will come pronto. Naturally, the check is payment in full for all your right, title, and interest in and to “The Story of Shamus Beg.” You will be delighted to know that all those folks who had an opportunity to “preview” the story liked it immensely. It has the qualities of charm, simplicity, and dignity, which ought to make it ideally suited as a Christmas greeting.